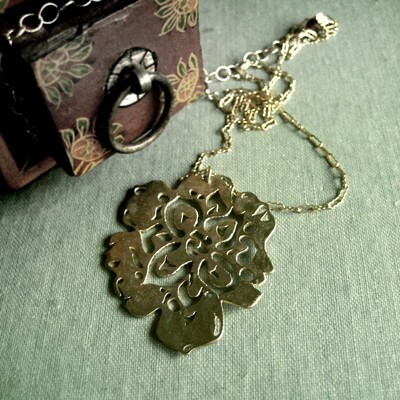 Cut from a sheet of metal and then cast in bronze, this succulent inspired piece invokes the quality of hand wrought artifacts of an earlier period. The surface of each focal piece in this collection is individually treated and as a result may vary slightly. Focal piece is 1.5" long. Chain is 14k gold fill. Chain is adjustable from 16" to 20" and closes with a lobster clasp.